Refrigerator cookies are easy cookies to make. You can tell how old this recipe must be by the alternate name – ice box cookies. How many of us even remember that people used an ice box? These cookies may be old fashioned but they are still a hit. Sift flour, baking powder, baking soda and salt. Cream shortening, add sugars gradually and continue to beat until light. add well beaten eggs and vanilla. Combine the dry ingredients and creamed mixture, blend well. Add the chopped cherries. Shape into 4 rolls and wrap each in wax paper. Chill in the refrigerator, at least overnight. (The dough can also be frozen and taken out as needed. When ready to bake preheat oven to 400°F. Cut the roll into thin slices with a sharp knife and place on an ungreased baking sheet. Bake for 5 to 8 minutes. Glace cherries are those cherries that are preserved in a sugar syrup and colored either red or green. You can buy them at any bulk food store for sure and at most grocery stores. The grocery stores will stock them at Christmas time for sure. It is important to chop the cherries finely. It helps to distribute the sweet cherries evenly thoughout the cookies so each bit has lovely cherry taste. Because they have the colorful addition of chopped red and green glace cherries, refrigerator cookies are a perfect Christmas cookie recipe and are often found at that time of year. Whether you use them as Christmas cookies or as everyday treats these colorful cookies will not last long in the jar. They are simple but SO good and taste much better than they look. The recipe is very similar to a shortcake recipe. It isn’t very sweet but has the nice added sweetness of the chopped cherries. 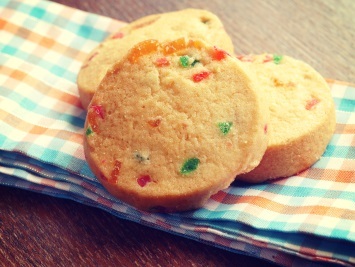 Refrigerator cookies are just one of our cookie recipe treats. Find them all here.